Around half the world’s pigs live in China, where these highly intelligent animals are often associated with luck, fertility and virility. So get your ‘Year of the Pig’ started with a bang in Manchester! Let’s face it: the main event. 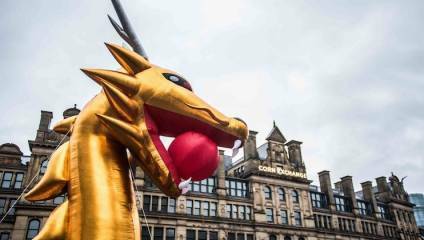 On Sunday 10th February, revellers can watch a spectacular 175-foot dragon sweep through the streets of Manchester, blessing all those it passes, from 12pm in Albert Square. The dragon winds its way from the Town Hall to Chinatown, where you’ll find Chinese dancing, unicorn performances, traditional street food and a fireworks finale at 6pm. Make a meme – and more! – at these free drop-in workshops, run by The Centre For Chinese Contemporary Art (CFCCA), inspired by their current exhibition ‘Chinternet Ugly’. On Sunday 10th February at the Arndale Centre, experienced practitioners will lead a relaxed, creative session to help you use traditional craft techniques such as printing and calligraphy to create a meme worth squealing over. What could be more piggy than a big pig? From Thursday 7th February a giant art installation called Piglet will be rolling into the city’s St Ann’s Square. This clever sculpture by British artist Alex Rinsler (famous for other big animal sculptures) doubles as a piggy bank, with a coat made of thousands of pennies, signifying good luck. Visitors will be invited to pop pennies into piggy banks placed around the sculpture, with proceeds going to The Big Change and the Wai Yin Society, who work with Manchester's most vulnerable residents. If you’re looking for something a little more chill this Chinese New Year, you’ll be happy as a pig in mud to find professional demonstrations on the hour and FREE workshops on the half hour at the Arndale Centre, run by Start Tai Chi. As the Chinese zodiac also cycles through elements as well as animals, 2019 will be the Year of the ‘Earth Pig’ – and what could be a more apt celebration than making pigs out of clay? Well, since you ask – how about making clay piggy banks in the Old Bank Building on Hanover St? This evening workshop, which gives you the chance to explore processes like oxidisation and wedging, takes place on Wednesday 6th from 6-9pm and costs £50 to participate. And yes – you can take your finished piggies all the way home.